When does a new prime minister really understand the burdens of the job? Kissing hands with the Queen? Walking through the big, black door of Number 10? Forming your government? Or is it, perhaps, when you hear that the country's nuclear weapons are now your responsibility - and decide what should happen to them if the government is destroyed by a nuclear strike? My bet is the latter, and now, thanks to the former Cabinet Secretary Lord Butler, who briefed both John Major and Tony Blair, we have an insight into what they get told. Speaking to Peter Hennessy for the BBC Radio 4 documentary Day One in Number 10, Lord Butler explains why the briefing is necessary. 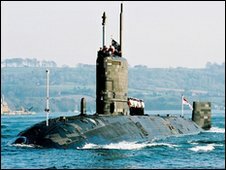 "There has to be provision for what happens if the government has been destroyed by a nuclear strike, and somebody has then got to say well we have our missiles on the submarines, out under the seas and what should the commanders of those submarines do. "And there has to be a plan for what would happen in that situation, and the person to make that plan - and it has to be made in advance because the home government may have been destroyed - should be the person that has been elected as the head of government. So that falls on the prime minister to make." We have known about the briefing for some time. Prime ministers are first told about the weapons' destructive capability by the chief of the defence staff. The cabinet secretary then tells them of a further responsibility - to personally write four letters, one for the safe of each Trident submarine, to be opened if the home government is destroyed. But no cabinet secretary has spoken about it before. Lord Butler says the letters are "desperately secret". He says the reason the decision is so sobering is because it has to be made at a time of peace and immediately when a prime minister comes to power. The cabinet secretary briefs on the options, and then he leaves the prime minister alone, in his words "to do privately, wrestling with their own beliefs and conscience." And they then seal the letters, return them to the cabinet secretary, and they are transmitted to the boats. Peter Hennessy asked Lord Butler how the two prime ministers he briefed reacted. "They reacted as you'd expect any human being to react: soberly, shocked if they hadn't realised before that that was one of the things that they would have to do at the start of their administration. So I would say it was a shock and a sobering one." Episode Two of Day One in Number 10 was broadcast on BBC Radio 4 on Wednesday, May 18, 2010 between 1100 BST and 1130 BST. Listen again on the BBC iPlayer.